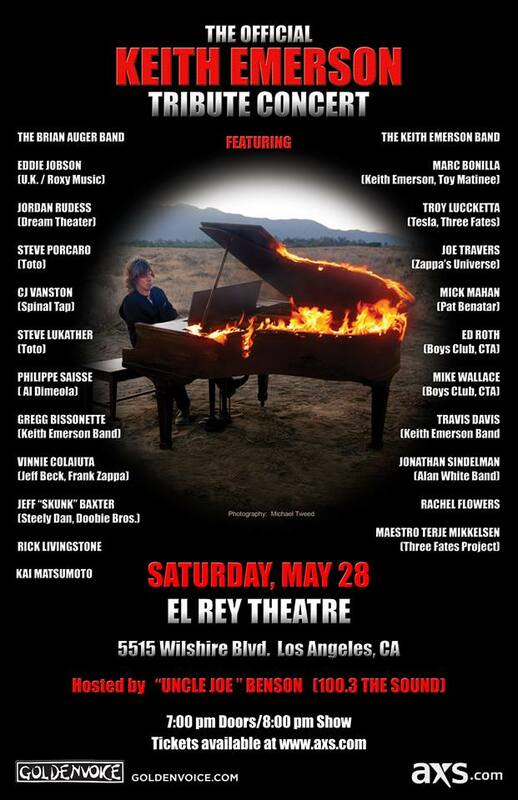 The Official Keith Emerson Tribute Concert will be held Saturday, May 28, at the El Rey Theatre in Los Angeles. It will be a retrospective of Keith's entire career from the Nice, to ELP, to the Keith Emerson Band and Three Fates Project. Many of the artists who were close friends and have worked with Keith will be performing some of his most famous works. It promises to be a great night of music and homage to one of the most influential musicians and composers of the twentieth century. The event will happen Saturday, May 28 at the El Rey Theatre. Look for us on air this Tuesday, April 19th at 8:20am, if you're in the Los Angeles area on Mark In The Morning - 100.3 The SOUND. My hope is to get there and record some interviews (both new and updated) for the documentary, although this is unbudgeted, so please continue to share and help us get there!